Walking Home by British poet and writer Simon Armitage is gaining popularity with current reviews in the New York Times (positive) and the Wall Street Journal (trending negative). And now here too. The author, a well known writer in England, walks the Pennine Way, a 270 mile north-south hike across the spine of England, following the valleys and (small) peaks of the land as it travels across moorlands and cuts in and out and around small towns. Mr. Armitage, married and 47 years old, sets out to walk alone after having arranged nightly lodging from well wishers and a series of poetry readings along the way as well. He made these arrangements while publicizing his trip via the internet. And at each poetry reading he passed the hat, or in his case a sock to collect funds to help supplement his expenses. 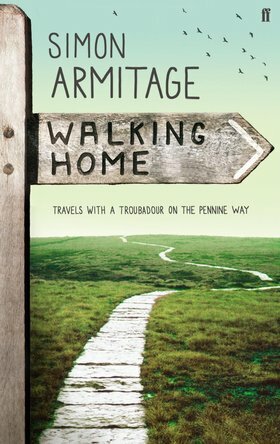 Mr. Armitage writes directly about his experiences, injects some humor, describes his surroundings and the people he meets, stays with and walks together with as well. I found his writing style pleasant if not always engaging and some of his observations thought-provoking. In one paragraph he reflects on the experience of staying each night in someone else’s house, usually in a spare bedroom of a child long since grown yet still decorated with awards and books and other memorabilia from years ago. These rooms are memory chambers he writes, just not his. For hikers and backpackers the thought of a thru-hike of the Pennine’s is enticing. Not too long. Food and lodging are nearby. Not too steep, with the tallest peaks less than the 3,000 foot high peaks of the Catskills. Yet with the fog and rain, one can get lost in the Pennines, making this walk not a ‘walk in the park’. Whether you are enamored with Armitage’s writing style or not, give him credit for introducing us to this 2-3 week walk, over hills and dales, across boggy moorland yet passing touchstones of Wordsworth and the Bronte sisters along the way. This entry was posted in News from Suffern Podiatry and tagged Armitage, backpacking, england, hiking, Pennine, walking by suffernpodiatry.com. Bookmark the permalink.